Icebox breezing five furlongs on Wednesday in preparation for the Kentucky Derby. The Churchill Downs countdown clock says it’s only 1 day, 6 hours, and 7 minutes until the first Saturday in May, better known as the Kentucky Derby. 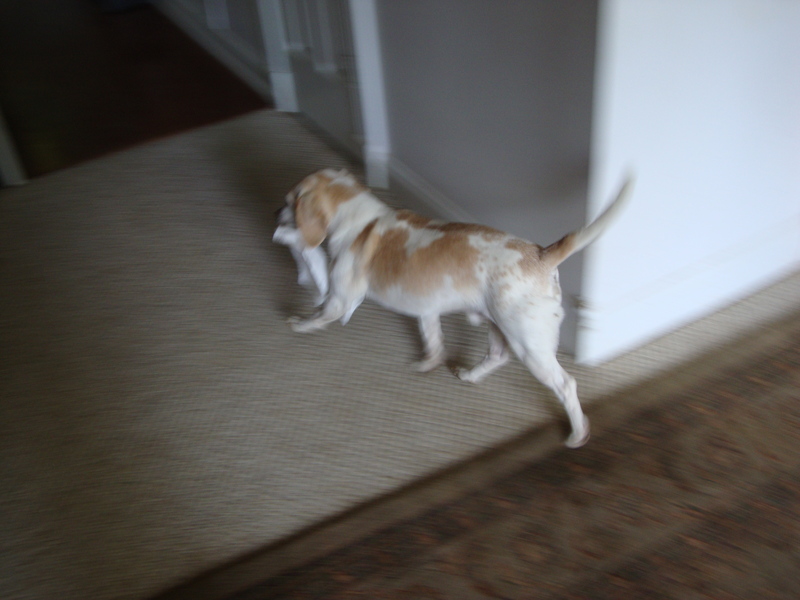 This year, we at Beagle House have a special interest in the race, because one of the 2010 Derby horses is Ice Box. 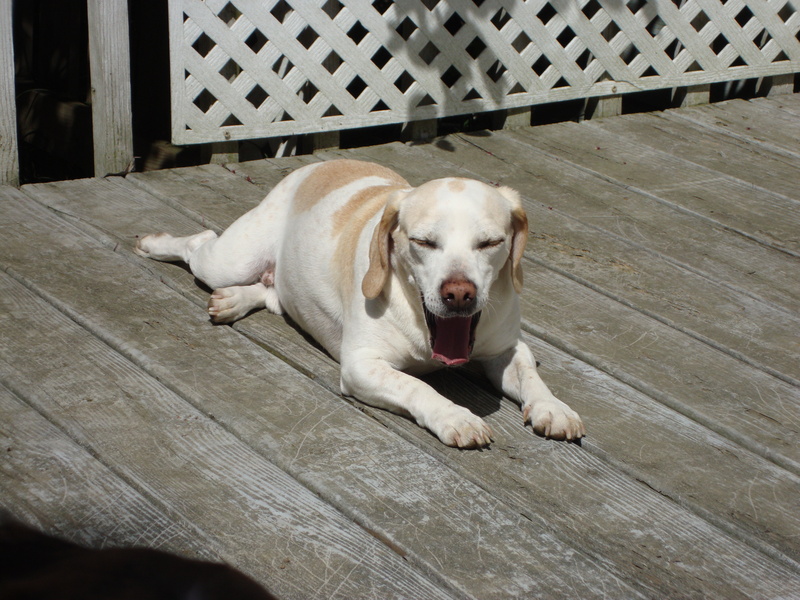 You might remember that one of the house hounds is also named Icebox–his hunting name when he was with the Clear Creek Beagles and before he retired to our house. So in this year’s Derby we have the ideal exacta Box! Ice Box at Churchill Downs, where he was 10-1 in the morning line. Photo by Churchill Downs/Reed Palmer Photography. Naturally, we were delighted when Ice Box won the Florida Derby by a nose in a real thriller. Now, we’re keeping paws and dewclaws crossed that he can run a winning race again on Saturday. After a good breakfast–breakfast is very, very, very important in Mr. Box’s training regimen–it’s outside for the most strenuous part of the workout. Fortunately, Mr. Box’s friend Bingo has volunteered to serve as both pacemaker and wrestling coach. From a lifetime of experimentation with various workout programs, Mr. Box has come to the scientific conclusion that this one is the best. Step one: wrestle with Bingo and Harry. "A vigorous wrestling match is good for the system," says Mr. Box. Harry gives Mr. Box a training tip: "Put your ears into it!" Mr. Box working in company. Mr. 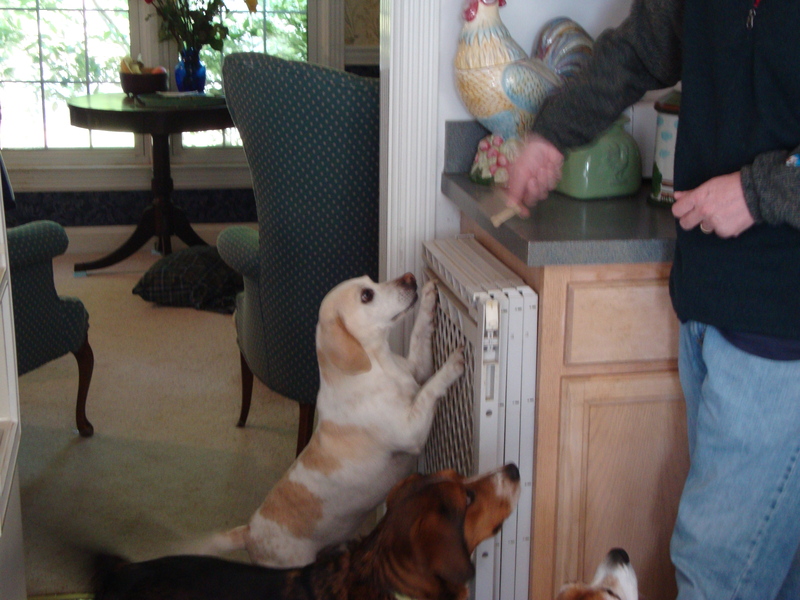 Box's gate training includes biscuit-catching, too. Mr. Box does have a secret weapon in his Derby training arsenal, revealed publicly here for the first time. It’s the Paper Towel Run. Step one: grab a paper towel out of the garbage can. The Paper Towel Run step one: the grab 'n' go. Step two: trot briskly away before they can catch you. Step three: Rip! Eating is optional, and you'll have to do it fast before you're caught! You’ll need plenty of rest after this strenuous exercise program. Or at least Mr. Box does. After all, Derby contenders need to be relaxed in order to make their big stretch run, right? Good luck to all on Derby Day, especially the horses. May everyone come back safe and sound, and here’s hoping Ice Box comes home the winner! 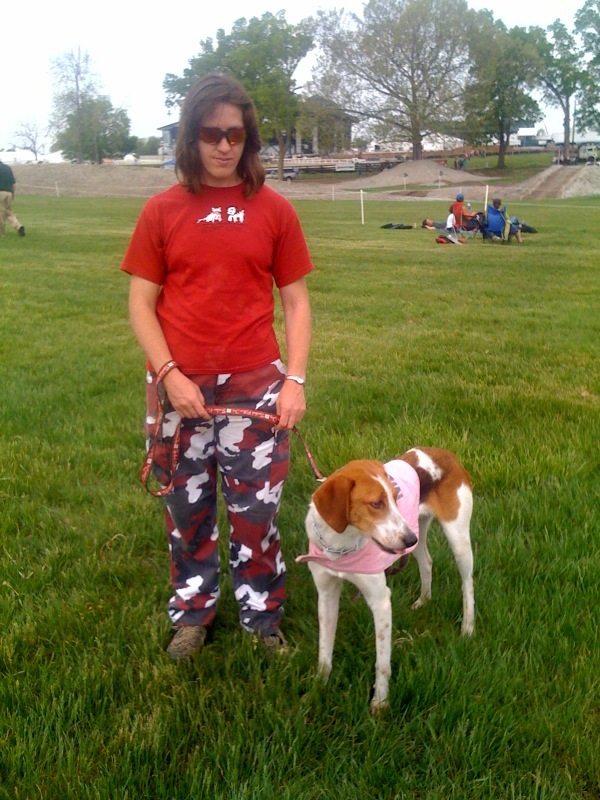 Scout the American foxhound attended North America's only 4-star event wearing a sporty jacket that said ADOPT ME! He's available at the Lexington Humane Society at (859) 233-0044. Please consider adopting him! The houndbloggers ran into him several times on Saturday, and he's got a great personality! THE annual Rolex Kentucky 3-Day Event at the Kentucky Horse Park in Lexington always brings out the dogs. Cross-country day, which always takes place on Saturday, is as good for dog-watching as it is for keeping an eye on the world-class equine athletes that are competing. So this year the houndbloggers, aided by their trusty iPhone, took some snapshots of every hound we passed. 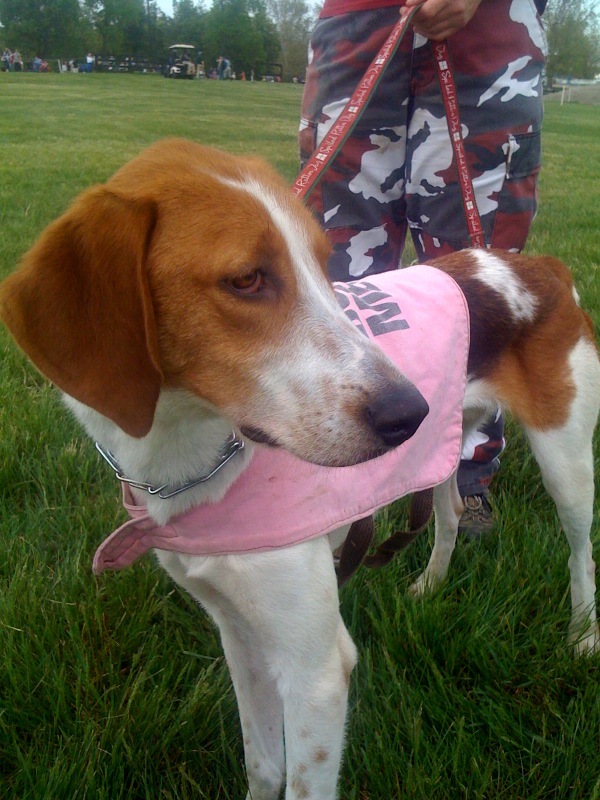 We start with Scout, a lovely American foxhound currently up for adoption at the Lexington Humane Society (telephone number 859-233-0044). We ran into Scout everywhere we went, and we stopped to say hello each time. We’d have adopted him ourselves except that we already have three hounds and have committed to adopt a fourth if she needs a home within the next year, and that puts us at capacity. 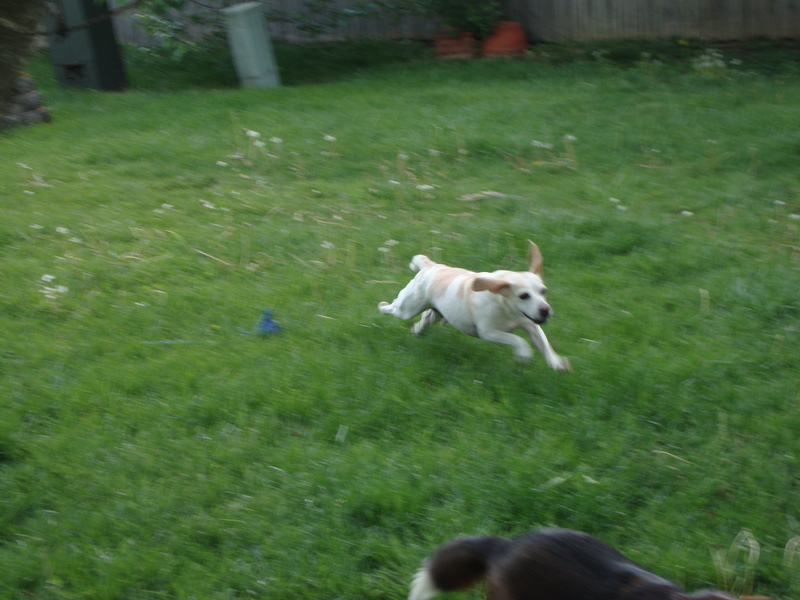 Our favorite thing about Scout: he’s a leaner. If you’ll stand there talking to him, patting him, or scratching his ears, he’ll lean gently against your shins. It’s a wonderful, trusting gesture that is also very pleasant for the leanee! 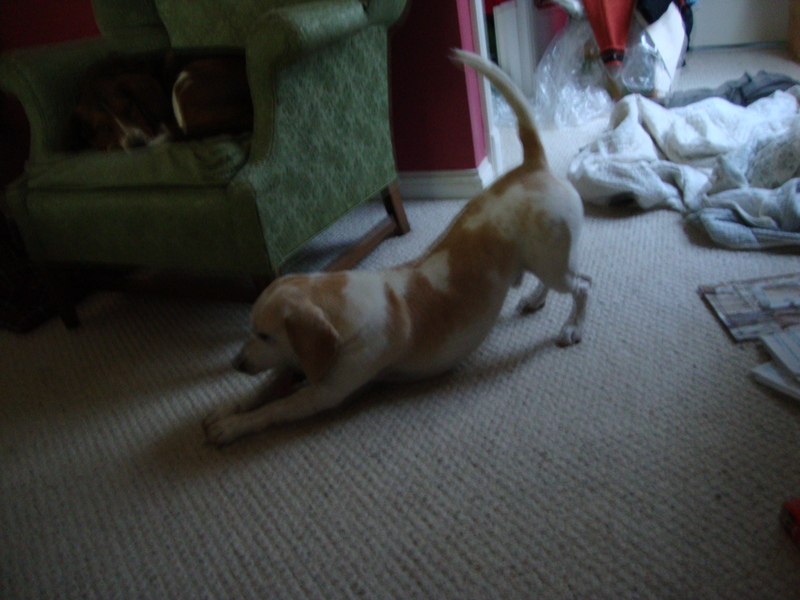 Please consider adopting Scout if you have the room and inclination. He’s been at the Lexington Humane Society since October. Chillin: Faith the six-month-old bloodhound found a comfy spot to nap. When the weather looked threatening, we did what anyone would do: we headed for the trade fair! 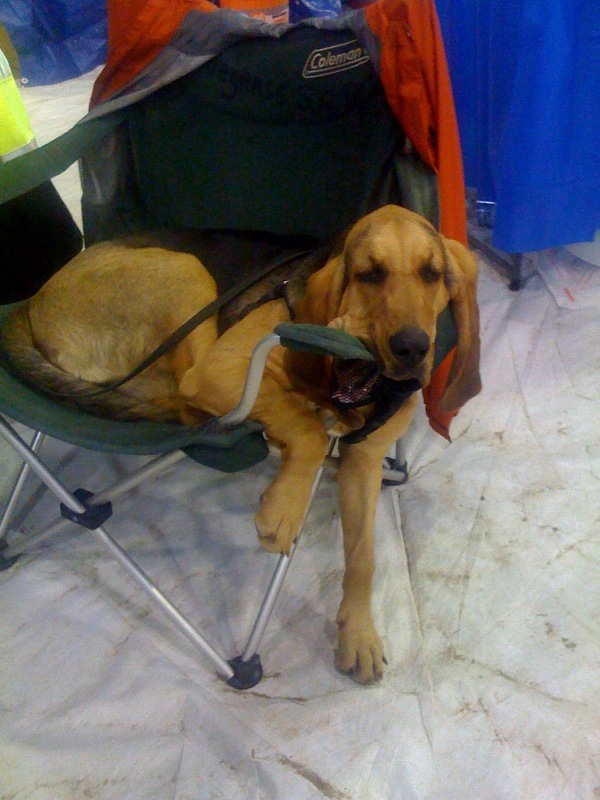 The first dog we bumped into in the indoor arena where the trade stands were was Faith, a six-month-old bloodhound who was napping at the Bluegrass Search and Rescue stand. Between calls to go find people, she sure is laid back. She happily allowed all and sundry to pat and scratch and fondle her enormous jowls and giant-sized puppy feet, and she only opened her her eyes once. 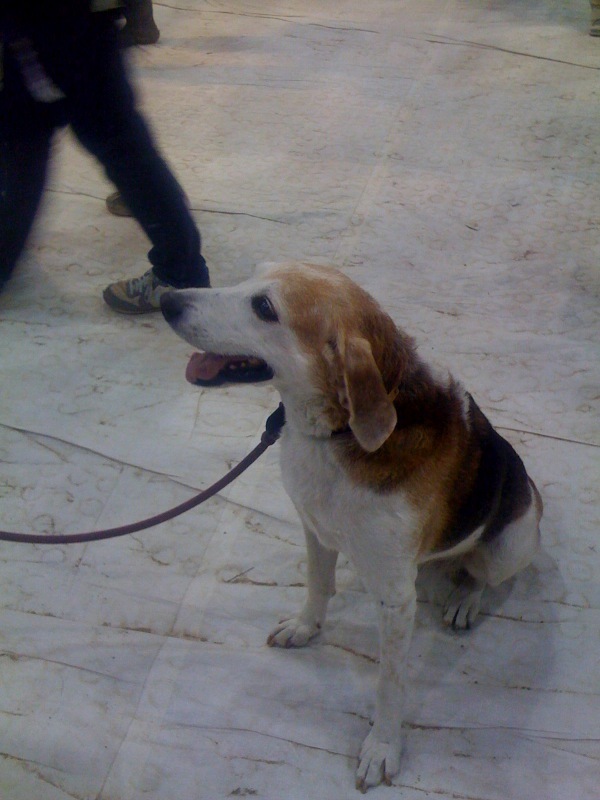 Nearby, but at the opposite end of the age spectrum, was Cyril, who was accompanying his human companion around the trade fair booths and wearing a big smile. Take a picture? No problem! Cyril was happy to pose before heading off into the merchandise again. 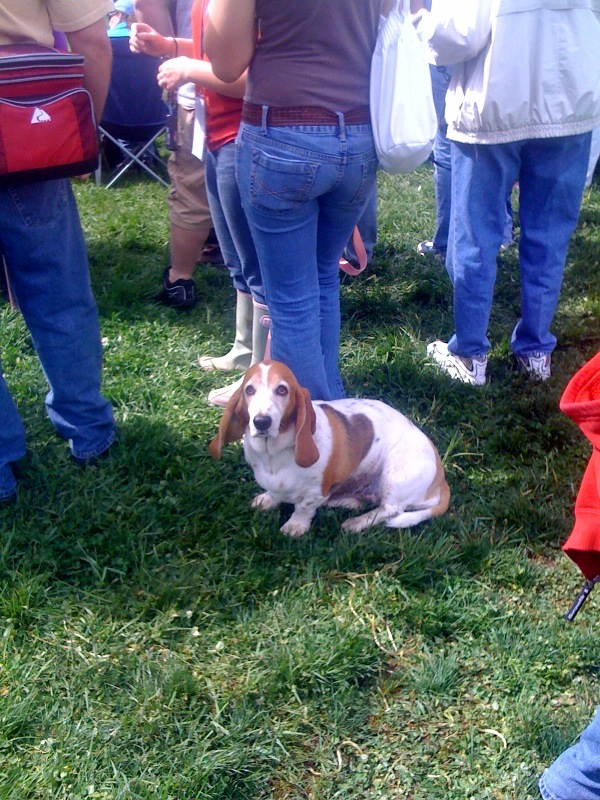 A basset hound who thought we looked more interesting than the popular Head of the Lake water jump. 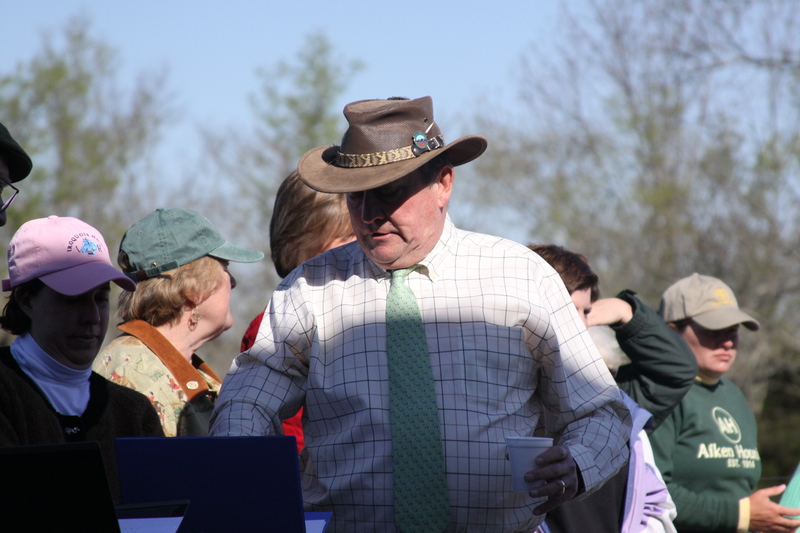 Fortunately, Saturday’s stormy weather held off for the cross-country portion of the event, so the houndbloggers got to spend a lot of time walking from jump to jump and watching some truly outstanding horses and riders. At the Head of the Lake (see eventual Rolex Kentucky 3-Day winner Cool Mountain and William Fox-Pitt jump this complex in the video below), we found a basset watching us instead of the course. You can see why: if you’re a basset, it’s not that easy to see through the forest of human legs. Nearby, Cody and his people also were enjoying the action at the Head of the Lake. 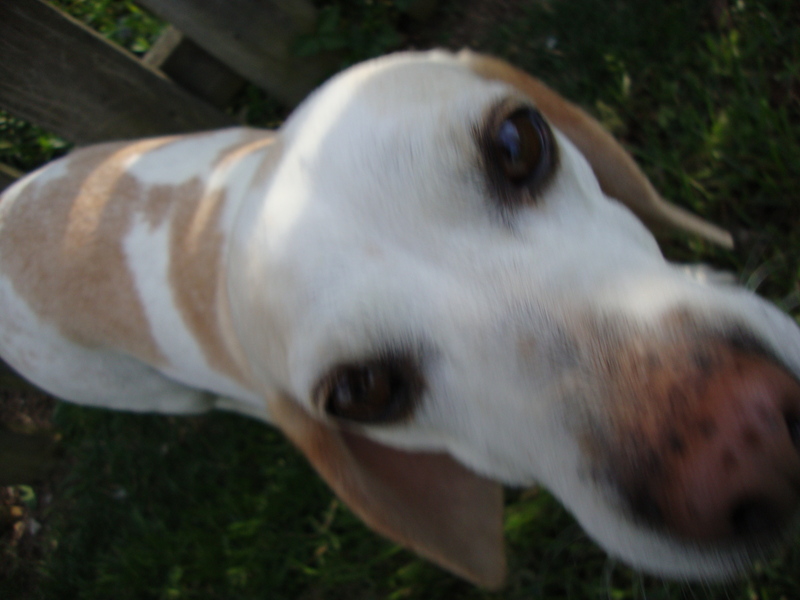 Cody, they informed us, is a coonhound. he reminded us of Driver, and not just because of the color: he was massive! His owner told us both Cody’s parents were about 100 pounds, and he’s even heavier. But he’s still got some height to gain to catch up to Driver. Avalanche, a former racing greyhound, enjoyed pats at The Hollow. We came across two greyhounds on opposite ends of the cross-country course. 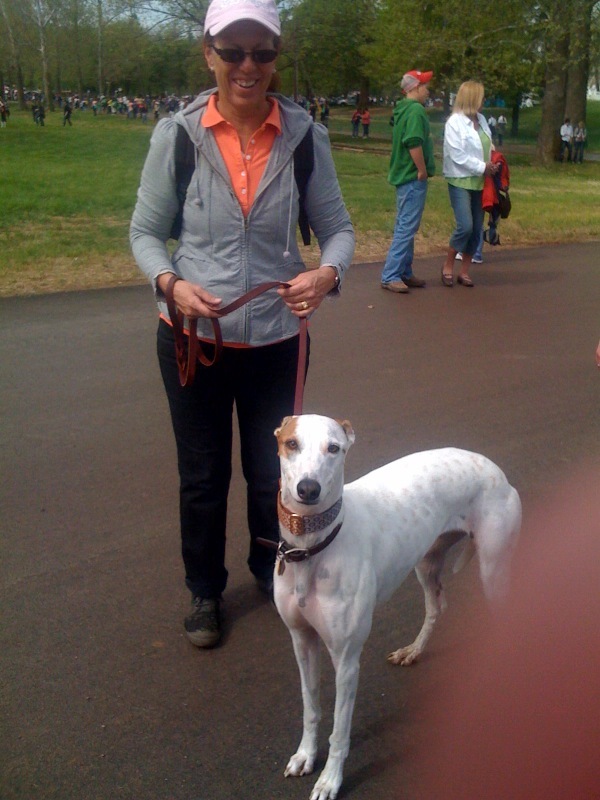 This gratified our guest for the day, Robin Foster, one of our favorite people and the devoted owner (with her husband Steve) of several greyhounds: Badge, who died in 2009, and now Popeye and Donny, all former racing greyhounds. Robin, if you’re reading this, congratulations! We’re giving you the coveted Game As Grundy Award for completing almost the entire cross-country course on foot, as well as a round of the extensive indoor AND outdoor trade fair, all with a broken toe! The first greyhound we met was Cleo (short for Cleopatra), who was more than happy to pose for a photo, which was messed up slightly by my fame-seeking finger peeking in on one side of the lens (continuing the houndblogger tradition of photographic mishaps). The lovely Cleo on a brief stop between fences on the cross-country course. The second greyhound we met was Avalanche, who was allowing charmed passersby to give him as much petting as they wished. That was a lot of petting, including from us. Avalanche was stationed at The Hollow, where rider Oliver Townend and his mount Ashdale Cruise Master had a scary fall that knocked them from the competition. Both horse and rider are okay. Here’s a more successful ride through The Hollow: Townend last year on Carousel Quest. Note that this year, the path through The Hollow ran the opposite way; in other words, horse and rider jumped a fence, then jumped down the two steps into the grass bowl, then galloped up to an exit fence on the opposite end. In 2009, the took the two steps and fence combination on exit. Do you know someone who has room for Scout? Those of us who have bought Lexington Humane Society t-shirts will recognize that Avalanche’s owner, holding the leash, is wearing one. Which brings us back to Scout. Here’s another view of this nice hound, who is currently at the Lexington Humane Society and needs a good home soon! Please consider adopting him. A break for a short film! 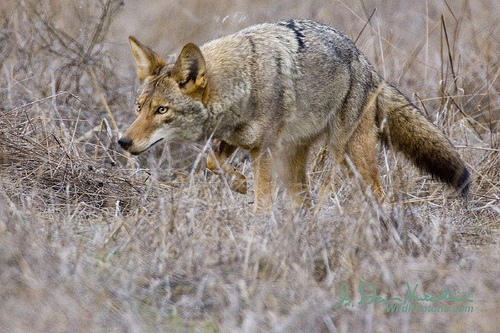 I know I said the next post would be about Dr. Stanley Gehrt’s MFHA seminar presentation on urban coyotes, but then this cropped up on the FrogDog Blog, via our friends at the Pet Connection blog. It’s a short video of an English dog show in the 1930s, filmed for British Pathe at the Richmond Dog show. 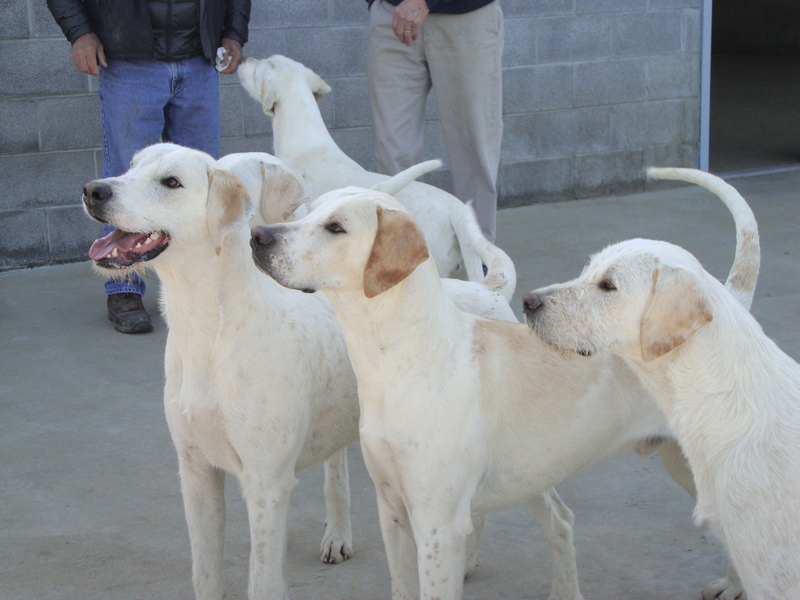 How many hound breeds do you count? 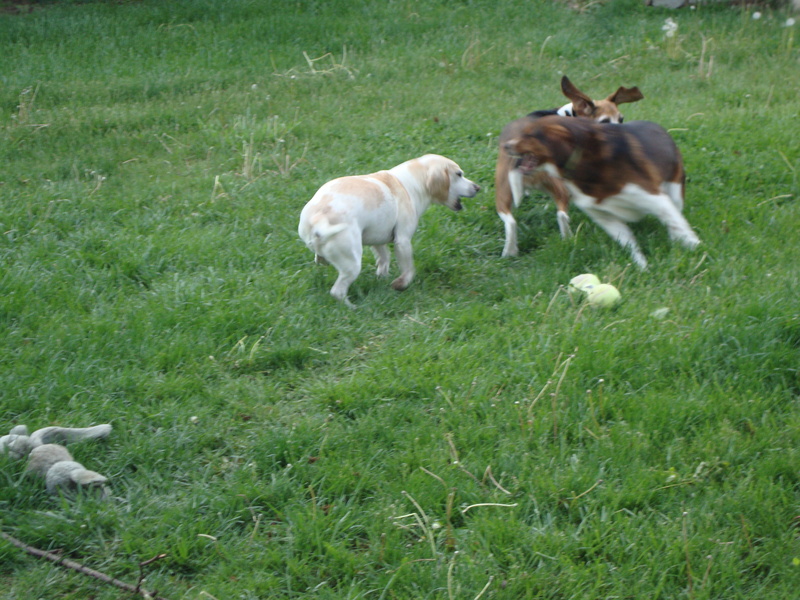 Not to mention the fox terrier puppies! See the video here–it’s well worth the click!–and there are other neat dog-related old films on the same site, for your enjoyment. THE “old guns” that took to the stage at the recent Master of Fox Hounds Association’s biennial hunt staff seminar have seen a lot of hunting. The “young guns,” some of fox hunting’s rising stars among huntsmen, touched on everything from choosing whippers-in to engaging field members in the hound work. But the older huntsmen had a tighter thematic focus. Most talked about two of the most important developments North American hunting has seen since these men first picked up a hunting horn: the change in quarry from fox-only to predominantly coyote, and the loss of hunt country due to urban and suburban development. The old guns’ panel was moderated by Iroquois joint-Master Jerry Miller, and panelists were Dr. Marvin Beeman (Arapahoe Hunt, Colorado), Marty Wood (Live Oak Hounds, Florida), Jody Murtagh (Moore County Hounds, North Carolina), and Mason Lampton (Midland Fox Hounds, Georgia). One man on the panel, Marvin Beeman, was the odd man out, in that he hasn’t had to face a change in quarry or the kinds of development that have threatened other hunt countries. In Arapahoe country, it’s always been about coyote chasing over the wide Western acreage. So Beeman was in a good position to talk about the coyote and its behavior on open plains, and his talk provided an interesting glimpse at hunting conditions we (relative) Easterners never have to contend with. Like hunting at 6,000 to 6,500 feet. In the high winds that whistle across the plains, Beeman estimates, about 90 percent of the time you’re hunting. Where “covert” is more likely to mean a slight dip in the land rather than 10 acres of woodland or scrub. Then there are the plains themselves: mostly flat, open land that provides little opportunity for sneaking up on any game, least of all the acutely sensitive coyote. Photo of the Arapahoe Hunt by Kathy Tourney. To see more, click here! Beeman pointed out that the Arapahoe often see their first coyote a half-mile away. That’s quite a challenge, especially considering that scent only lasts, on a good day, from three to six minutes, far less in the 40 to 50 m.p.h winds that can blow across Arapahoe territory. Whatever difficulties Colorado’s geography and climate throw at coyote hunters and their hounds, they do get one advantage in return: few roads and miles of open space. In a country Beeman estimates to be about 35 square miles, there are only two roads, and they’re seven miles apart. Some of the individual pastures in the Arapahoe country are 5,000 acres, so it’s hardly surprising that Beeman uses both radios and tracking collars for his hounds. It might surprise you to know Arapahoe hunts with English hounds, whom many American hound proponents believe are too slow for coyote-chasing. That’s a debate that once raged about fox-chasing, too, as you might recall from the English v. American debate that resulted in the Great Hound Match of 1905. Marty Wood of Live Oak remembers the changeover from red fox to coyote very clearly, and chasing the wiley coyote has left a mark on him. 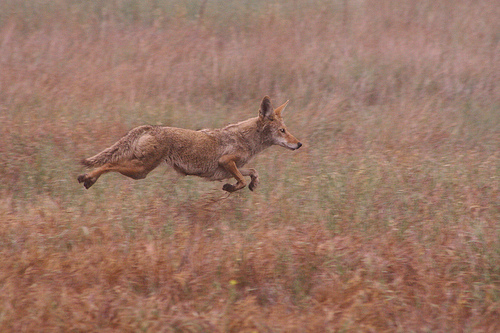 The Live Oak hounds ran their first coyote back in 1984 or 1985. 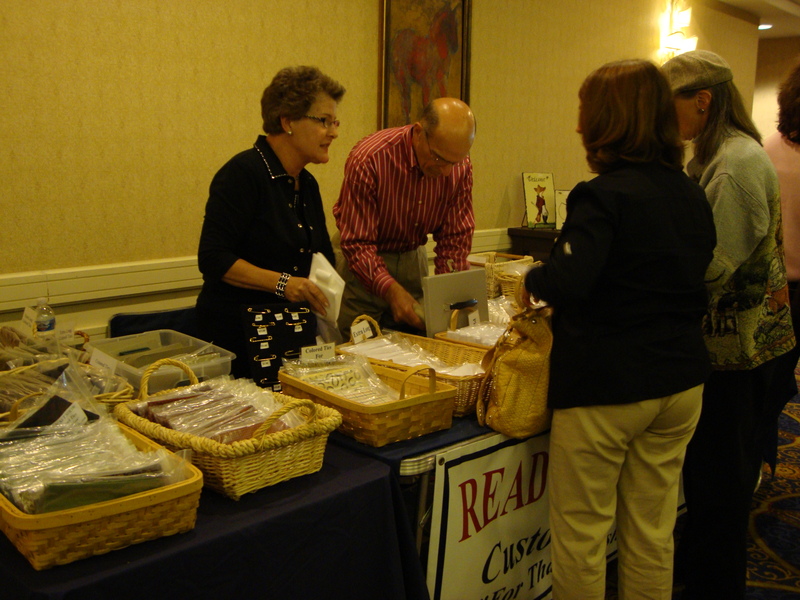 Between panel sessions, MFHA seminar attendees could shop for stock ties, MFHA merchandise, and hunt-themed accessories. Luckily for Murtagh, not all of the coyotes in his country leave it. 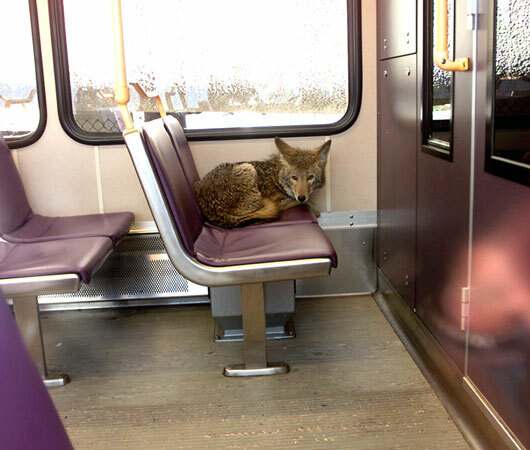 The resident coyotes tend to stay in his country. 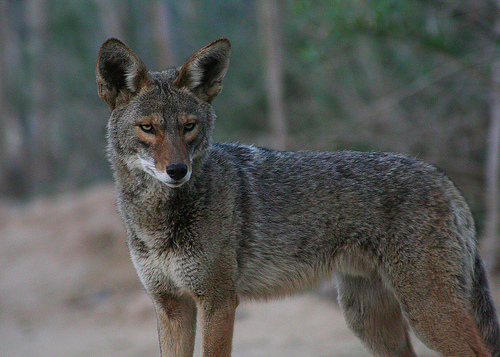 By contrast, coyotes that come into the country from nearby Fort Bragg, which covers about 60,000 acres, are the ones that tend to run back across the road to their home territory. 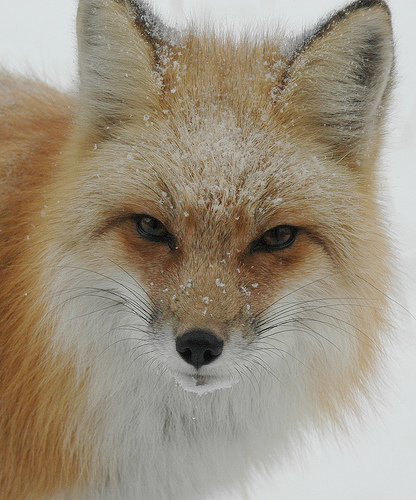 Murtagh said that he does occasionally have a good run on a gray fox, something he tries to take advantage of, because the gray foxes provide great sport for his field on a limited territory. “It’s been a whole different kettle of fish,” he said. Lampton said he drew the same spot the next two hunts, trying to get up the same coyote, and, when he did, the hunt went exactly the same, with his staff having to stop hounds at the same edge of their country. “These coyotes, when they find a spot where you’ll stop your hounds, they’re gonna go every time to that spot,” he said. 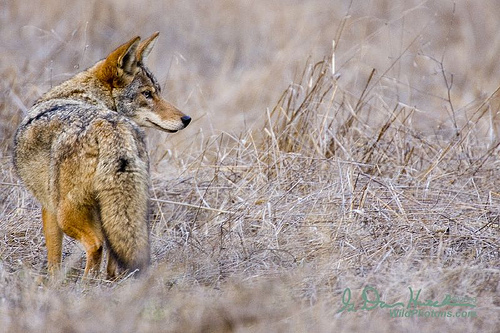 In fact, the days of hunting a close-bunched pack might well be over anywhere coyotes have become the main quarry. 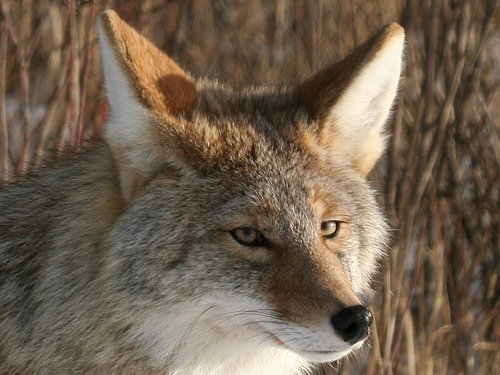 Next time: Dr. Stanley Gehrt on the life of the urban coyote! Some of the Iroquois members at Sunday's MFHA hunt staff seminar. 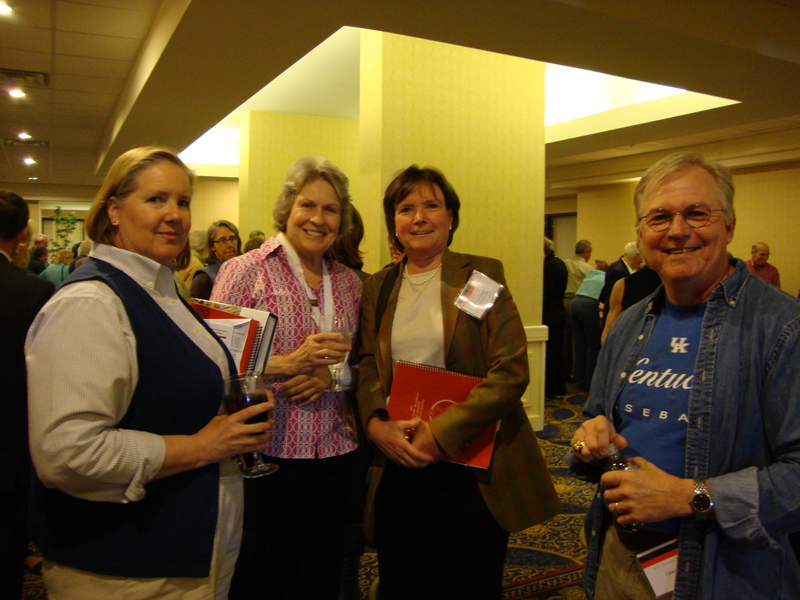 Left to right: Nancy Clinkinbeard, Mary Moraja, huntsman Lilla Mason, and Gene Baker. 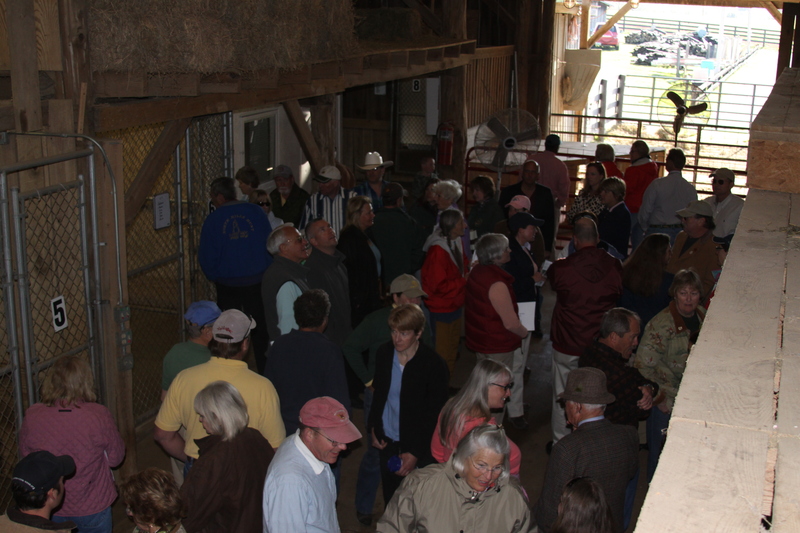 IF Saturday at the MFHA biennial hunt staff seminar was field trip day (for a tour of the Iroquois Hunt Club’s kennel and a visit with our retired hounds), Sunday was more of a lecture series. But not some musty, fusty maundering on by dull speakers, no way. There were panel discussions featuring some of the hardboot Masters and huntsmen from hunts around the country and from the “young guns” of a new generation of hunting stars. There was a meaty and highly entertaining presentation by a scientist who studies the urban coyote. 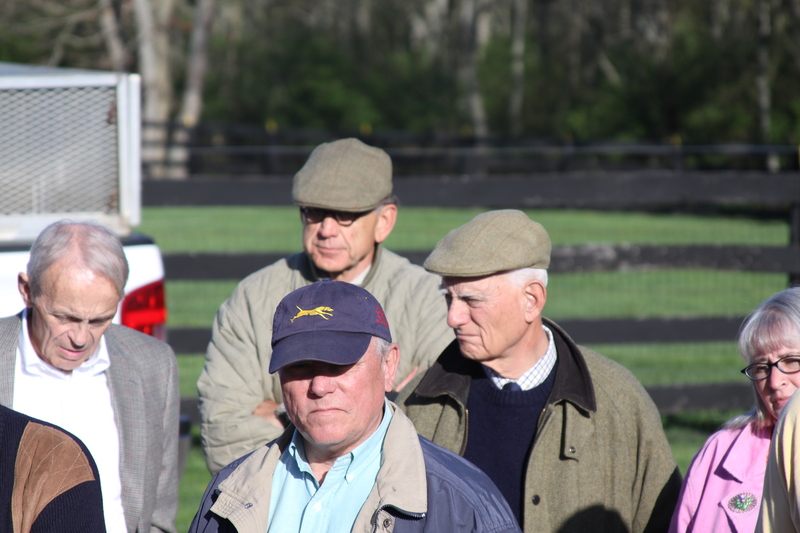 And there was a panel on the eternal question: how do I get and keep my horse hunting fit? The houndbloggers attended three of the four discussions, missing the equine fitness one, and so we can offer a summary of the presentations that related to hounds and coyotes. It's all about the hounds! We should say right off the bat that Iroquois huntsman Lilla Mason was among the presenters as a member of the “young guns” panel. 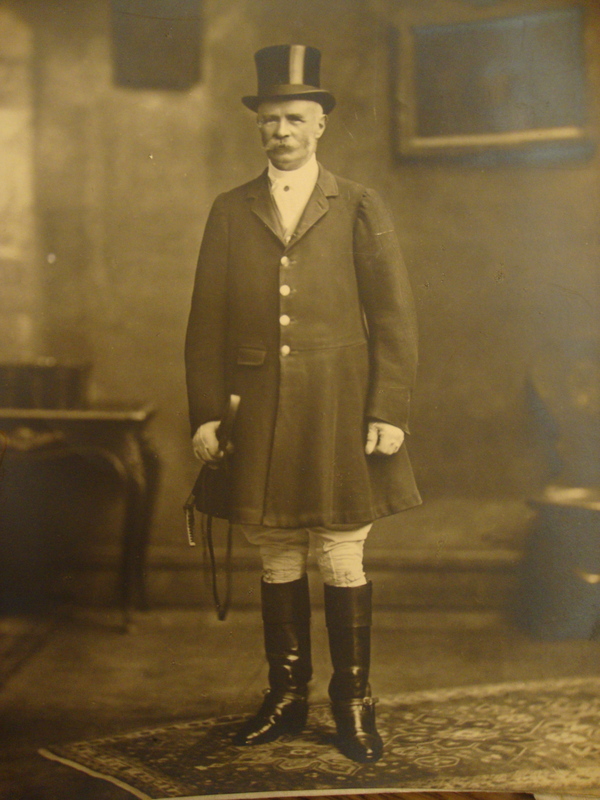 She was the only amateur huntsman, and the only woman, alongside fellow huntsmen Peter Wilson of the Grand Canyon Hounds (Arizona), Ciaran Murphy of Golden’s Bridge Hounds (New York), Reg Spreadborough of the Orange County Hunt (Virginia), Adam Townsend of the De La Brooke Hunt (Maryland), and Ken George of the Moingona Hunt (Iowa). Lilla Mason (Iroquois) focused on the process by which field members become hound lovers, just as she did. Like many of us, Lilla was drawn to hunting primarily due to her passion for riding, but the more she learned, and the closer she got to the hounds, the more she came to love hound work–a process that eventually led to her carrying the horn as the first female huntsman at Iroquois. Lilla emphasized the success Iroquois has had through inviting hunt members to help with summer walk, leash training for the puppies, and other similar activities that give members a window onto the hounds’ everyday lives and the hunt’s breeding and training programs. 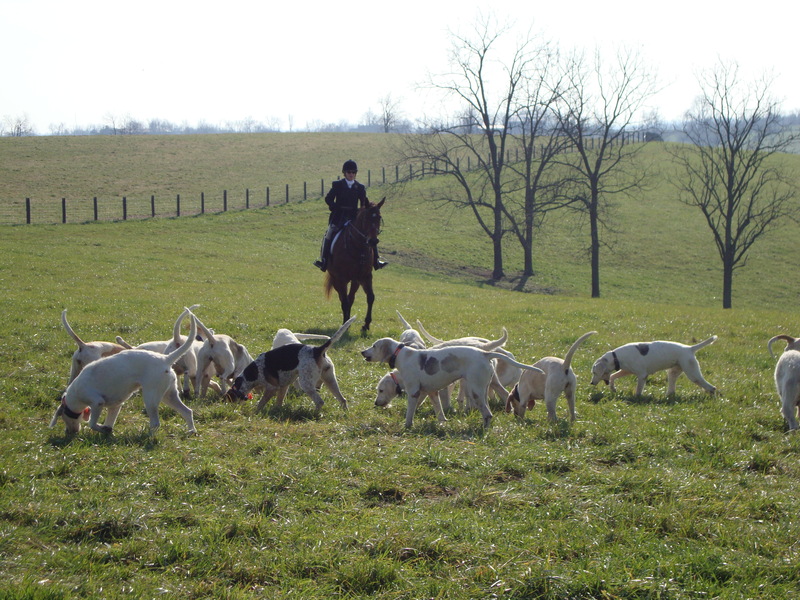 She noted that giving the field printed out hound lists at each meet has also given riders an opportunity to learn the hounds’ names and follow them through each hunt day. 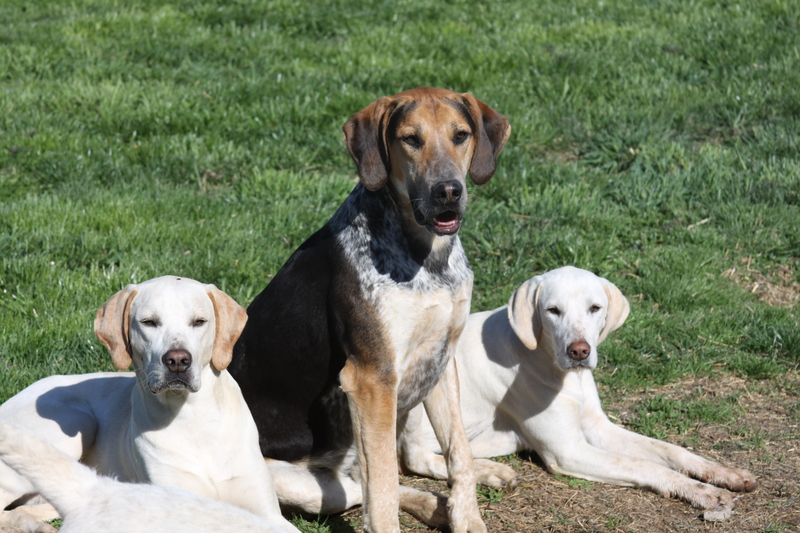 And other initiatives, such as Lilla’s “Hound of the Day” reports, also help give the field (as well as Iroquois social members) a connection to the hounds and a different perspective on the hunt day. 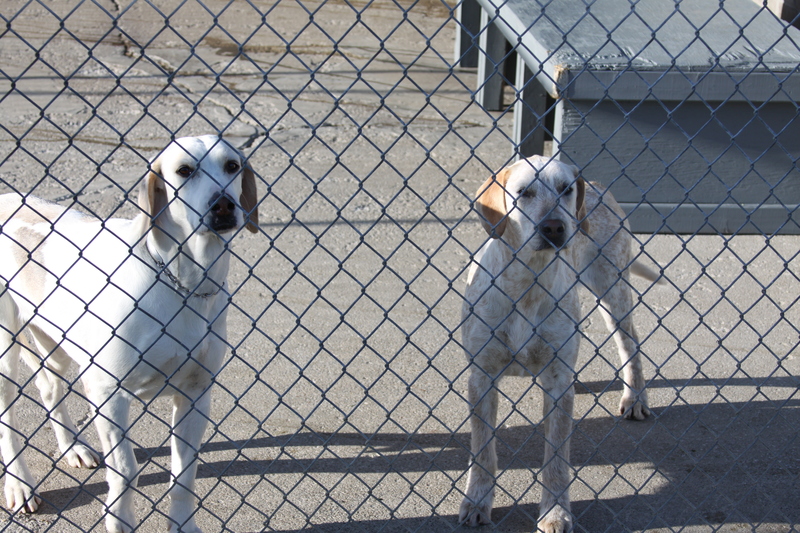 IHC member Cooper Lilly and Payton: kennel visits are mutually beneficial! 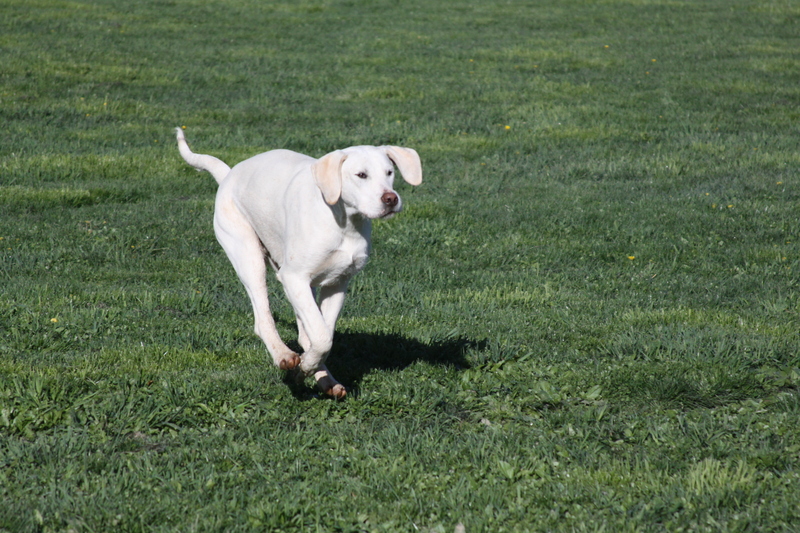 Lilla recalled vividly the first time Iroquois joint-Master Jerry Miller handed her the horn and gave her the opportunity to hunt the hounds herself. The most startling change: suddenly, no one else seemed to know what they were doing, from Lilla’s new perspective as huntsman. All the whippers-in Lilla knew and had worked with on the hunt field as a whipper-in herself suddenly seemed to have become inept fools. “They weren’t in the right place, I wanted them here and they were over there,” Lilla said, laughing along with the audience as she recalled her bemusement. “And nobody was back there, where I wanted somebody. And they were all walking, why weren’t they trotting? Why weren’t they doing anything? 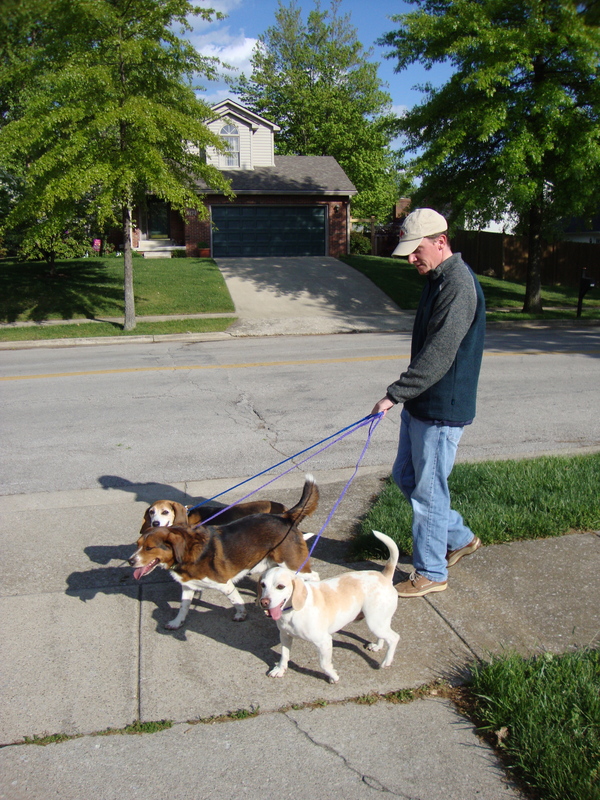 Summer hound walks provide a good opportunity for Iroquois members and guests to learn about the hounds and their training. “If you hold your thumb out in front of you and stare at your thumbnail, everything else is a blur,” she said. “When you’re hunting the hounds, all of a sudden you’re using your eyes to collect information from the whole world. You’re looking for every opportunity to get information: what the body language of the hounds is telling you, what the temperature is, where the wind’s coming from, what you see in the coverts. Collecting information to try to take advantage of any opportunity that might help you help the hounds produce good sport. And when something interrupts that canvas, it’s really irritating. Iroquois Driver with one of his friends at the kennel. 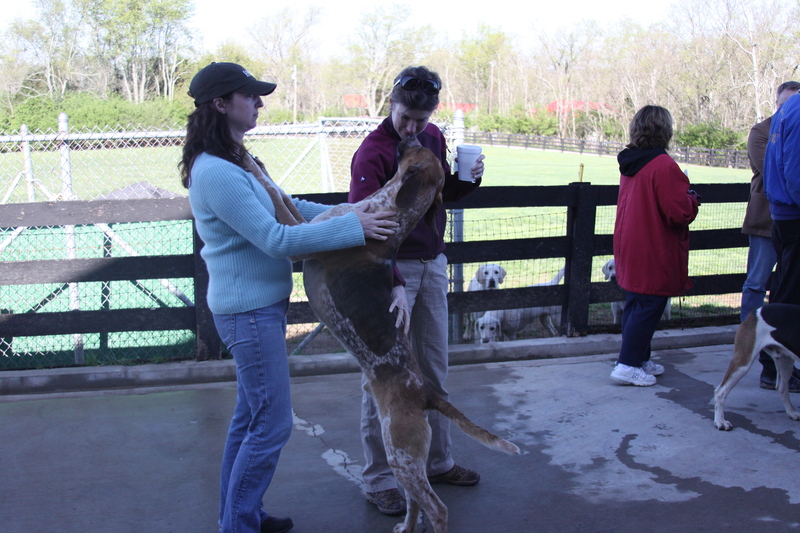 When members visit the puppies, they learn about the young hounds, and the hounds gain confidence around with new people. All of the huntsmen on the panel except Lilla were professionals, and a majority advocated a quiet attitude in dealing with hounds, something the houndbloggers were gratified to hear. 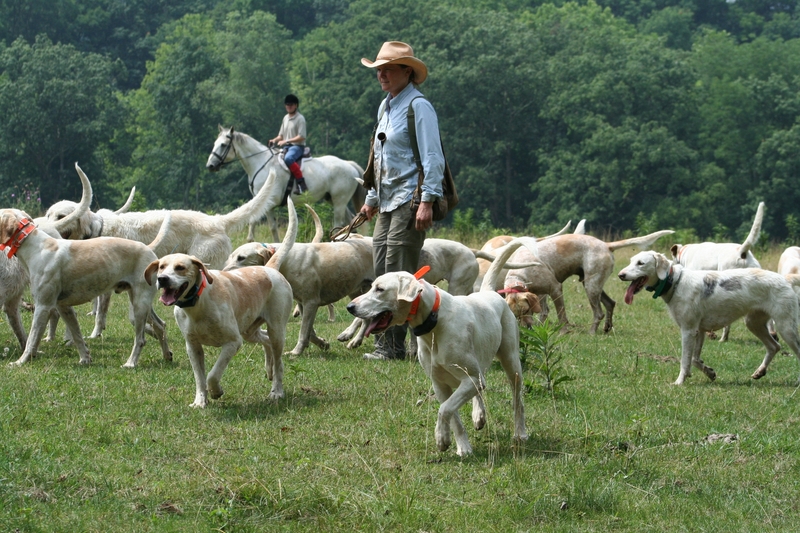 Many of the "young guns" on the panel recommended a quiet style with hounds. One common concern the huntsmen voiced: loss of country, a complaint that almost every hunt has as rural land is eaten up by development. Like Iroquois, Murphy uses radios as well as road whips to help protect hounds in an area where roads and development are encroaching. One of the more interesting things Murphy said, at least to us, was that he is still chasing both fox and coyote at a ratio he estimates at about 50-50. It’s been a long time since we’ve heard of a fox percentage that high, as most countries seem to have all but made the switch from foxes to coyotes as coyote territory has expanded (more on that in our next post, when we report on the outstanding presentation Dr. Stanley Gehrt made on the urban coyote!). Murphy said his tactic, when he’s chasing coyote in a small country, is to try to turn the coyote to persuade it to stay in the country. 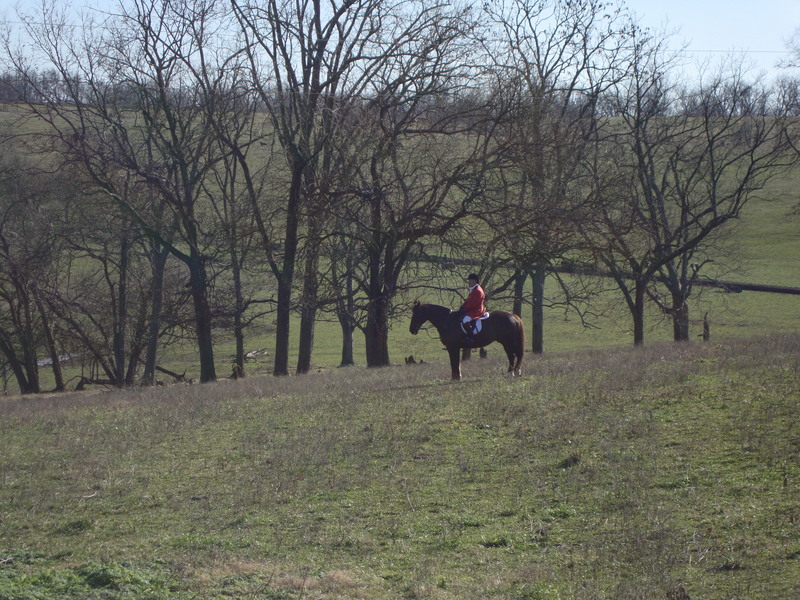 Diminishing hunt country remains a concern for nearly every huntsman and Master. Spreadborough said, in his experience, a mixed-age pack is more liable to get strung out on a run as older hounds pull ahead of younger ones; stringing out, he said, is “my pet hate, if I have one.” But he acknowledged that he still hunts foxes, and that allows for different tactics. “With foxes, we don’t tend to get the hour-and-a-half, two-hour hunts that the other packs would hunting coyotes,” he said. Spreadborough made an interesting point when he said that, just as there’s ideally a “golden thread” of communication between huntsman and hounds, there also should be a similar thread linking huntsman and hunt staff. “If you find a whipper-in that you can key off, you almost don’t even have to say anything,” he said. It's ideal if the huntsman and whippers-in also have a "golden thread." Also on that point, Lilla recalled a story in which an English huntsman she knows once stood ringside with her at the Peterborough foxhound show and relayed what one of the judges was saying as the class progressed some yards away. “He was able to do that because he had served as whipper-in to the judge for many years and had learned to read his lips!” she said. Adam Townsend of the De La Brooke Foxhounds spent a good bit of time discussing the importance of whippers-in to a huntsman’s work. 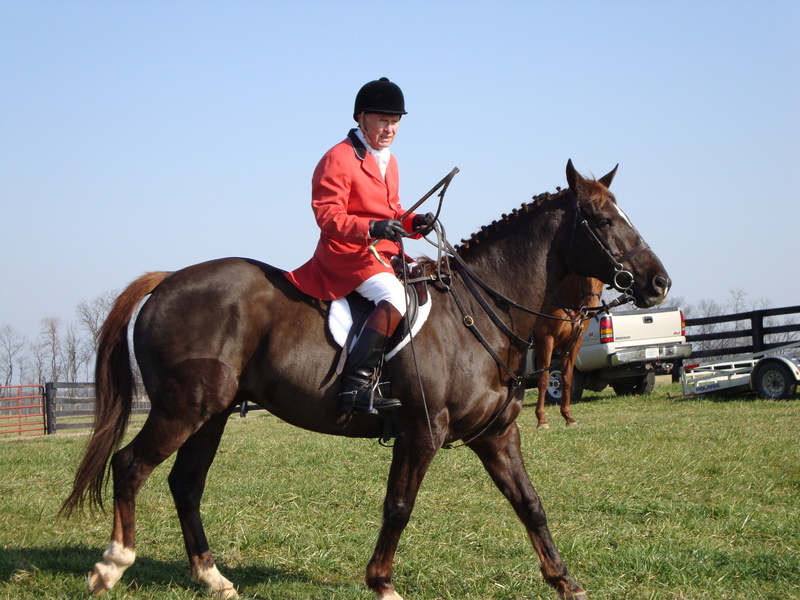 Many huntsmen prefer a quiet, relaxed whipper-in, believing they help keep the hounds relaxed in their work as a pack. “I’ve found that new whips tend to be ‘whip happy’ and want the pack to be tighter,” he said. Townsend added that he does not encourage his staff to crack their whips unless it is truly necessary, as in a safety situation out hunting, when, for example, hounds might need to be kept off a road. 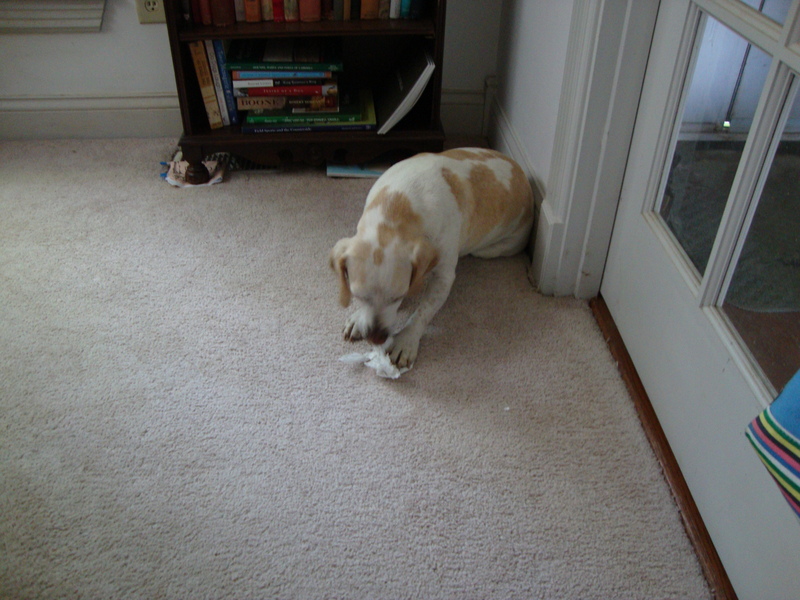 “I don’t like tense whips, because that makes for tense hounds,” he observed. Ken George of Moingona proved an able storyteller and kept the audience’s attention with his vivid description of hunt days on the Iowa plains and, more recently, to newly opened country in Kansas. 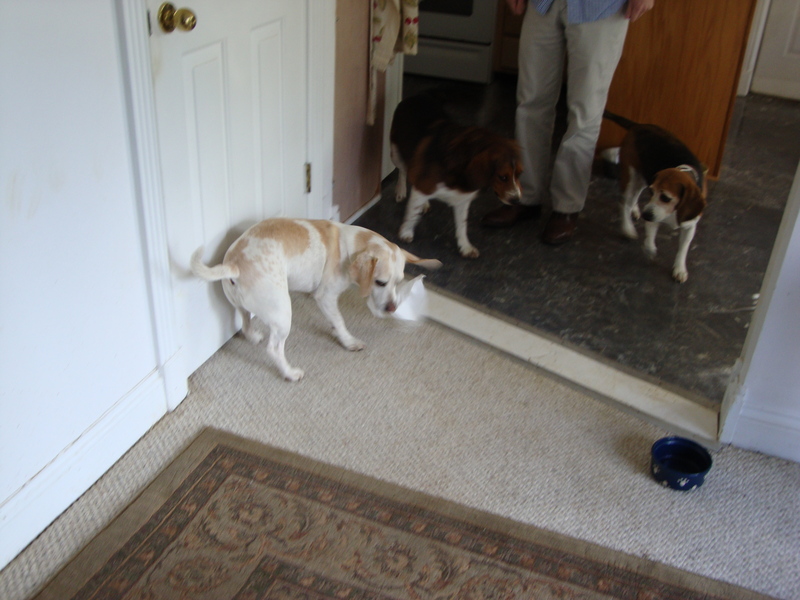 Do whatever it takes to get out with the hounds! Unlike Spreadborough, who hunts fox exclusively, George said he didn’t mind if hounds get strung out on a run and viewed it as a natural effect of chasing the coyote. 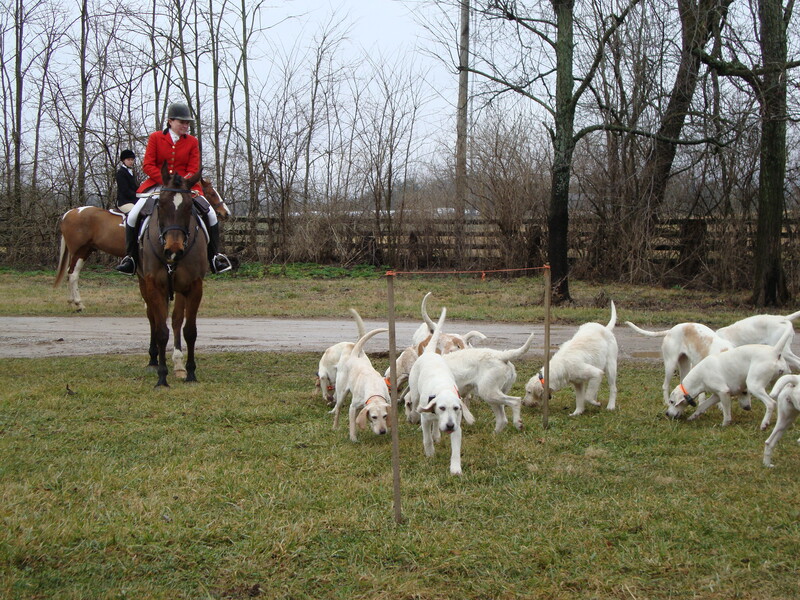 George’s main theme, though, was one every serious huntsman and hunt follower knows well: the true fox-chaser (or coyote-chaser) will do whatever it takes to watch those hounds work together to puzzle out a line. George pointed out that he shoes horses and works cattle for landowners, all free of charge, in order to ensure his country stays open and he can keep hunting. When the opportunity to open hunt country in Kansas some six hours south, George said he jumped at it. Next time: The “Old Guns” panel! 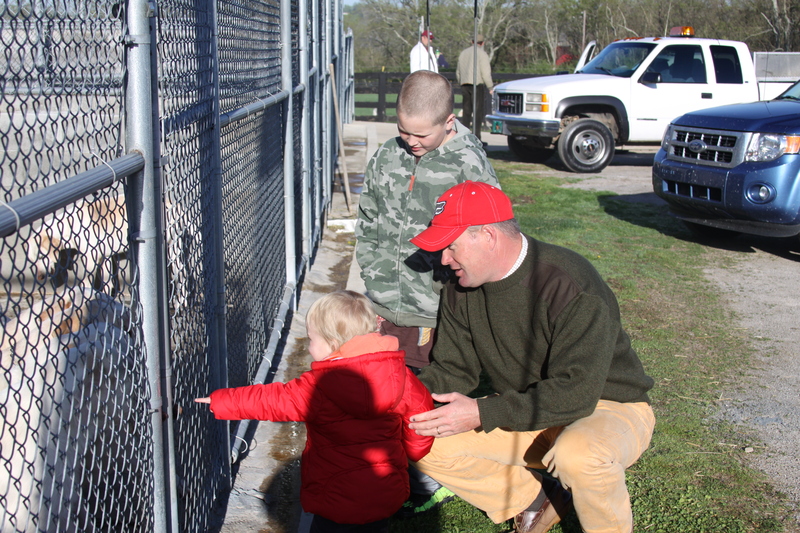 Iroquois huntsman Lilla Mason shows the BA litter to Live Oak MFH Marty Wood (left) and Iroquois joint-MFH Jerry Miller. Photos by Gene Baker--thanks, Gene! 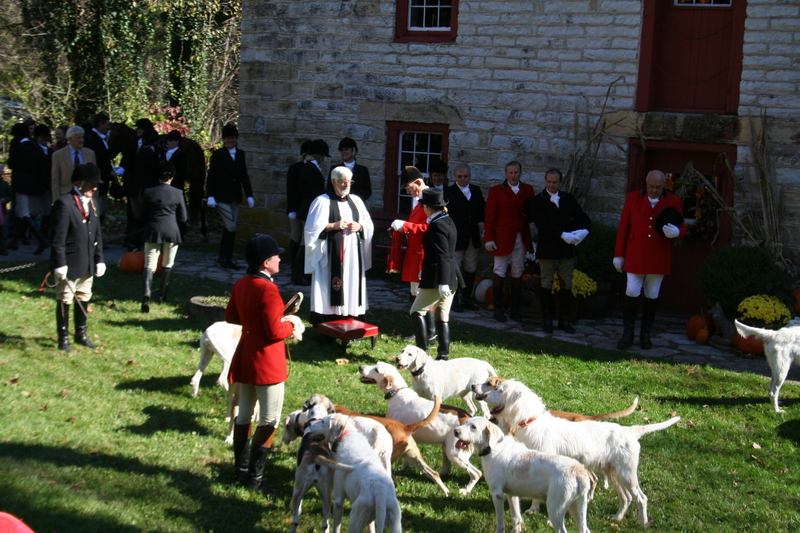 THE Master of Fox Hounds Association’s hunt staff seminar only comes around once every two years, so imagine our delight when the governing body of North American foxhunting selected Lexington as the venue for 2010. 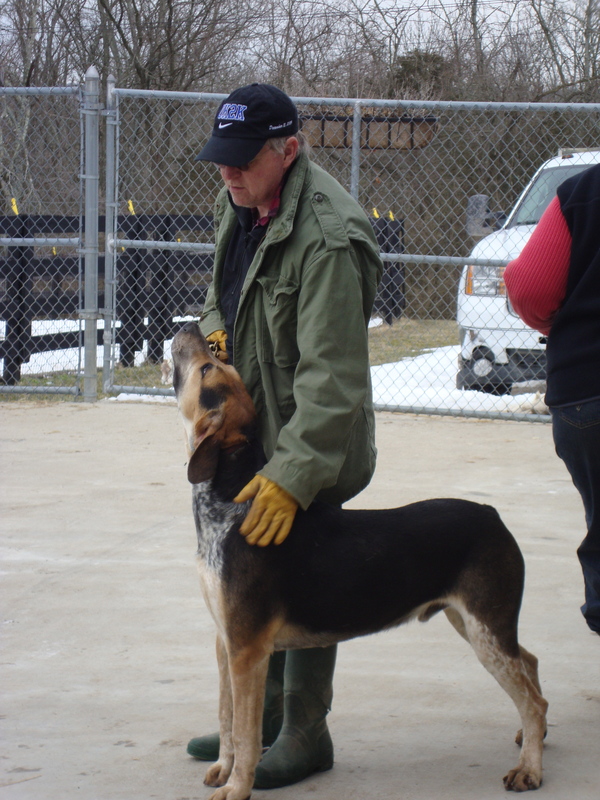 The seminar weekend drew foxhunters from around the nation to the Iroquois kennel, and the gathering of so many hound people in our town provided a priceless opportunities to listen and learn. 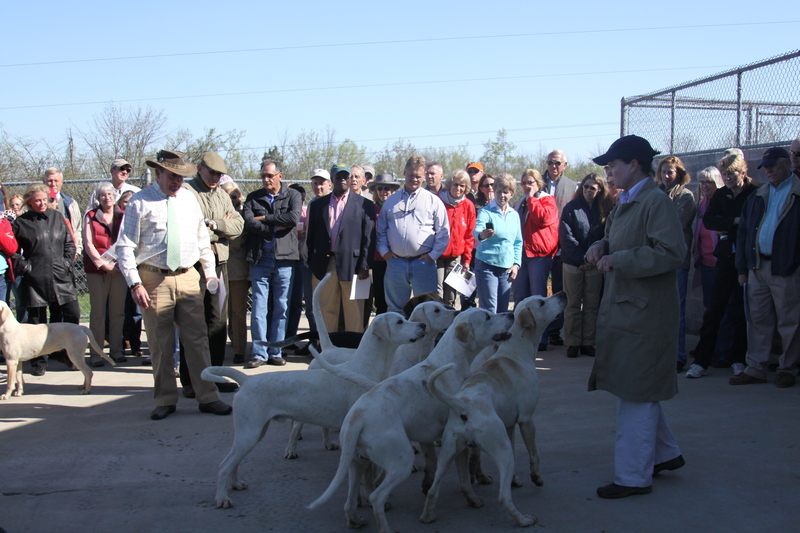 On Saturday, April 10, the Iroquois Hunt hosted a kennel tour for attendees, and about 70 Masters, huntsmen, hunt staff, and members of many hunts showed up despite chilly temperatures. 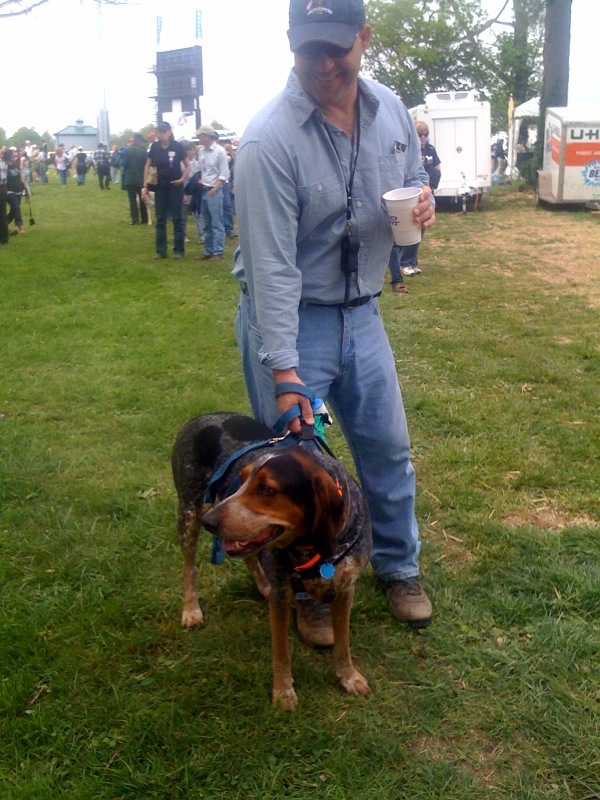 Two highlights really stand out for the houndbloggers: the warm reaction so many hunt members had to seeing the Hound Welfare Fund‘s retirees happily snoozing in their warm room, and watching Live Oak Master Marty Wood reunite with Paper, Hailstone, Gaudy, and Gaelic, young hounds that he bred that began their hunting careers this year with the Iroquois pack. Wood looked just like a proud papa when he saw how these puppies have developed, and he even joked that letting them go might just have been a mistake! And here’s another interesting note: asked to choose their favorites from our current crop of puppies, the BA litter and Driver, all scheduled to begin their training with the pack this summer for the first time, Wood and several other huntsmen present picked out Driver the pupposaurus for special praise, citing, among other things, his powerful, muscular hind end. Driver (center): Not quite a year old, and already a muscle man. It’s true: Driver has lost a lot of his baby fat and is showing distinct signs of turning into a hunk. But he’s lost none of his charm–or his energy. It was especially rewarding, by the way, to see how confident all the puppies were –not that Driver’s confidence has ever been much of a question!–around a crowd of 70 strangers. Their lack of shyness under these unusual circumstances drew favorable comments from many and is a testimony not just to the puppies’ personalities, but also to their early handling and training. 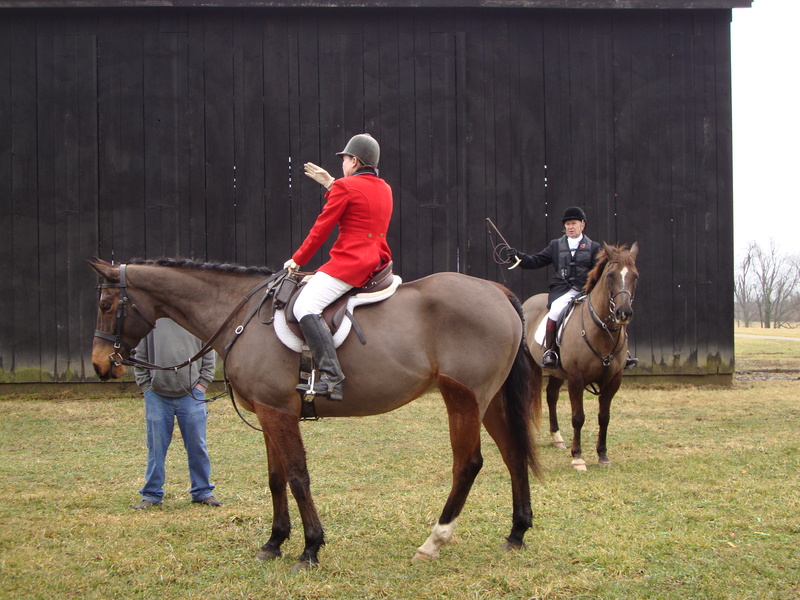 Iroquois huntsman Lilla Mason tosses biscuits for some of the new entry as MFHA hunts staff seminar attendees look on. In addition to seeing the new entry and viewing many of the other hounds in the Iroquois active hunting pack, seminar attendees also toured the inside of the kennel. 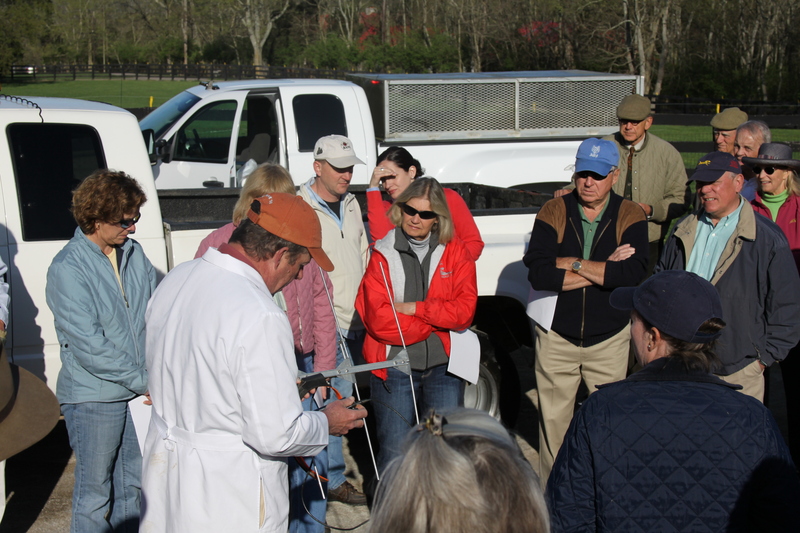 Many were especially interested in the tracking collars demonstrated by Iroquois kennelman Michael Edwards. Iroquois kennelman Michael Edwards demonstrates the tracking collar and antenna that we use to help protect hounds when they are out in the country. 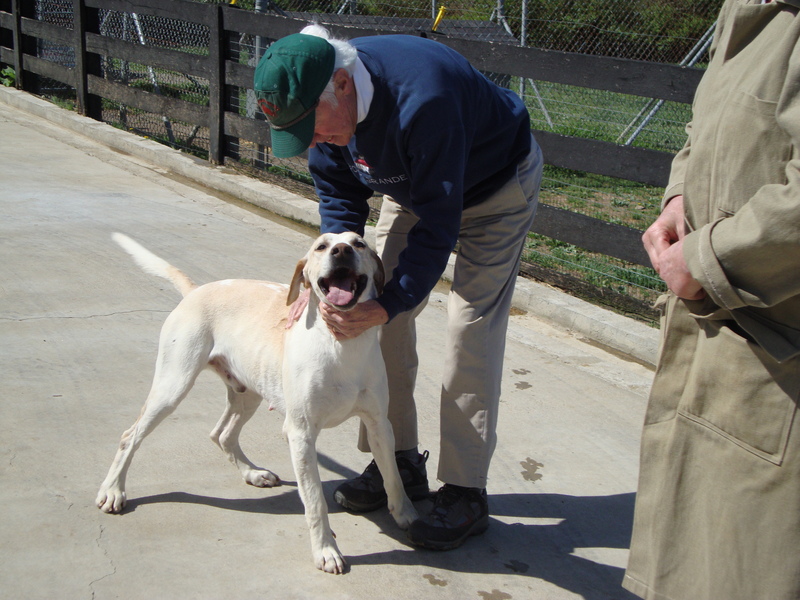 Iroquois joint-Masters Jerry Miller (left) and Dr. Jack van Nagell at Saturday's kennel tour. Iroquois board member and former president Dr. Herman Playforth also explained how the hunt club itself is structured to allow both hunting and social, non-hunting memberships. 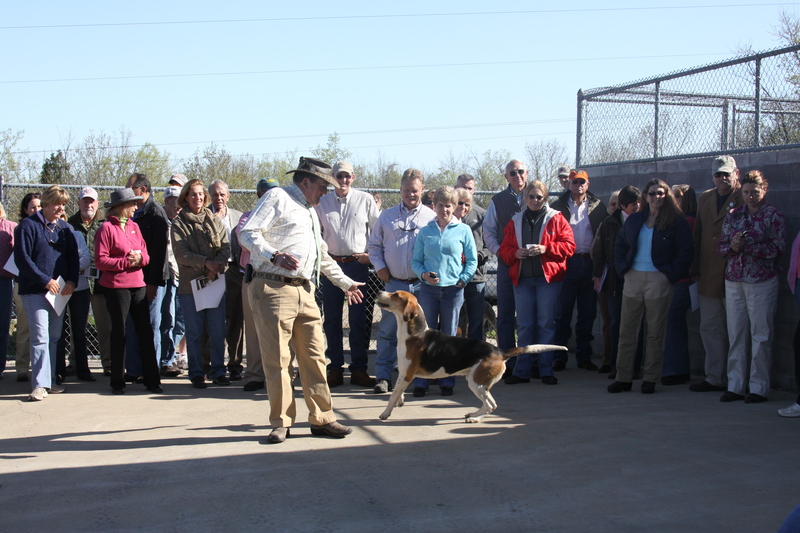 Seminar attendees asked good, detailed questions that covered every imaginable topic: kennel management, hound feeding, the use of radios and tracking collars on the hunt field, and much more. Thanks are due to everyone from Iroquois who volunteered to help with the morning. These included Cice Bowers, Christine and Gene Baker, Nancy Clinkinbeard, and Eloise Penn, and I sure hope we haven’t forgotten to mention anyone else! Thanks also to Michael Edwards and Alan Foy for their work with the hounds, and to guest Robin Cerridwen for her help, too. 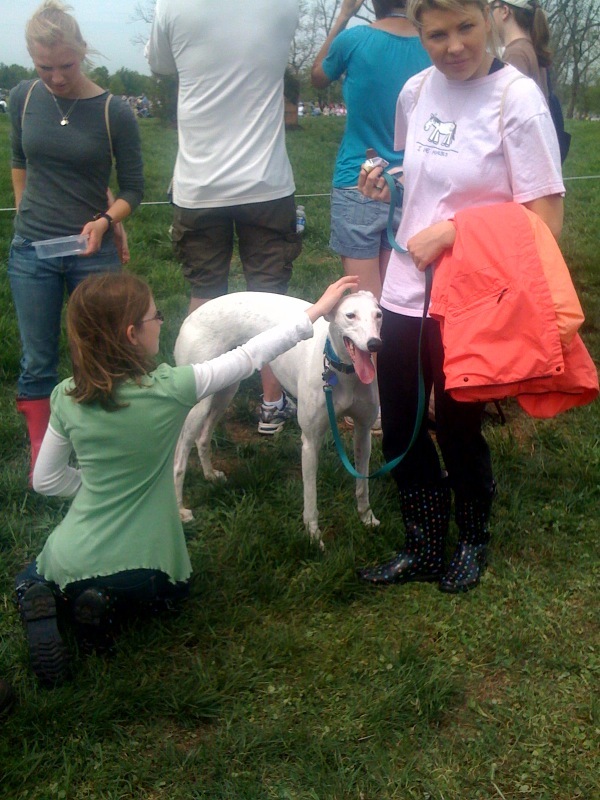 One of the first-season hounds, Gaelic, gets some lovin'. We’ll leave you with some images from the day that particularly caught our eyes, and tomorrow we’ll summarize the meat of the weekend: the seminar programs from Sunday, including a presentation by coyote researcher Dr. Stanley Gehrt and a panel discussion that included Iroquois huntsman Lilla Mason. The kennel tour also drew new entry of the human kind! 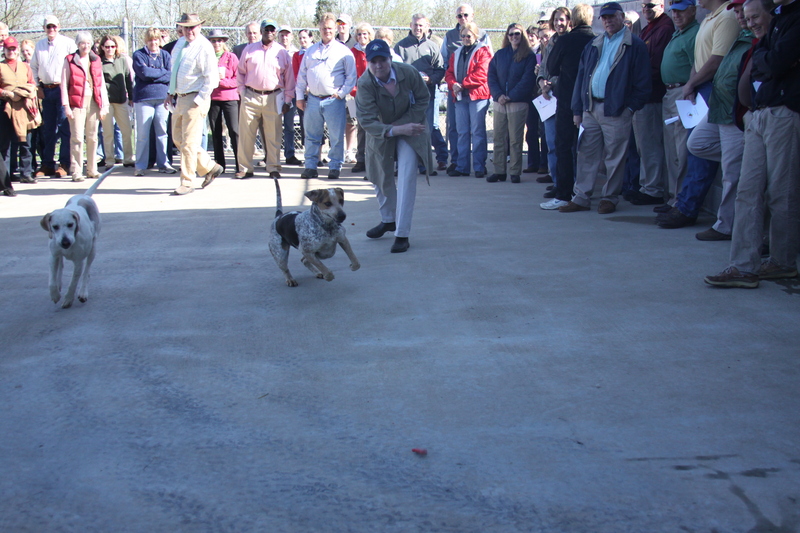 Paper and his breeder, Live Oak MFH Marty Wood, do the cha-cha. 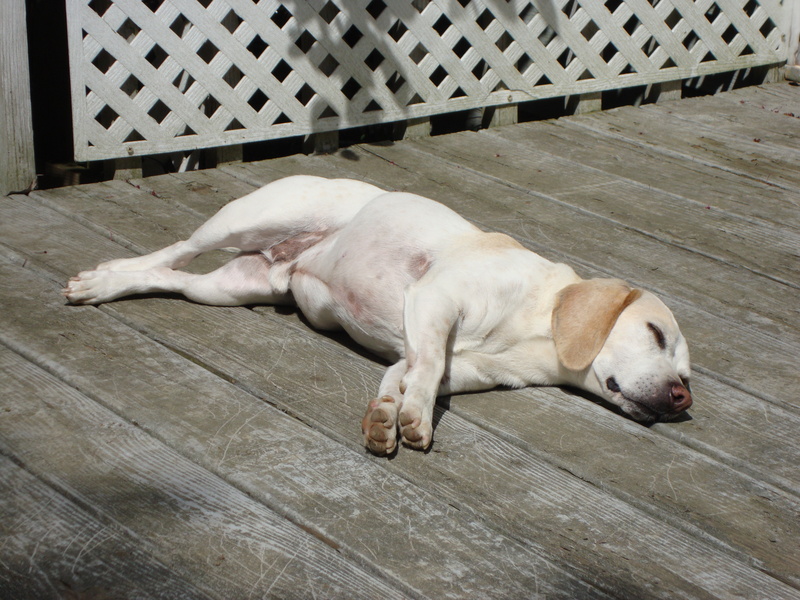 The hounds and their visitors enjoyed perfect weather once the spring chill wore off by mid-morning.